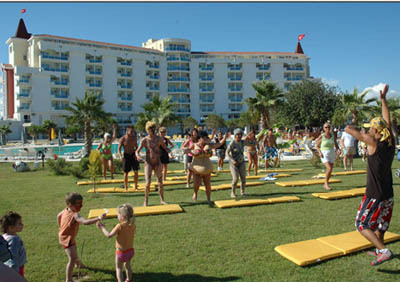 Located near city centre of Didim (1 km. ), 90 km. to the Bodrum-Milas Airport, 150 km to the Izmir ADB Airport. Breakfast hall * patisserie * cafeteria * lobby bar * snack bar * pool bar * roof bar * restaurant bar * disco * vitamin bar * terrace restaurant * 1 outdoor restaurant * 1 indoor restaurant * 2 meeting rooms * ballroom * TV room * internet connection * mini club * children’s playground. 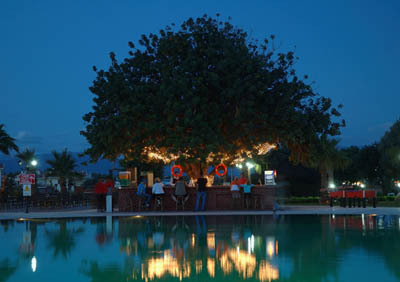 Outdoor swimming pool * indoor swimming pool * children’s swimming pool * aquapark * waterslide * Turkish bath * sauna * fitness center * football * volleyball * basketball * jogging * dart * billiard. Jacuzzi * solarium * wellness center * SPA & thalaso centre * beauty centre * laundry & dry cleaning services * ironing service * safe box at reception * market * cinema * doctor * babysitter * health room * water sports. 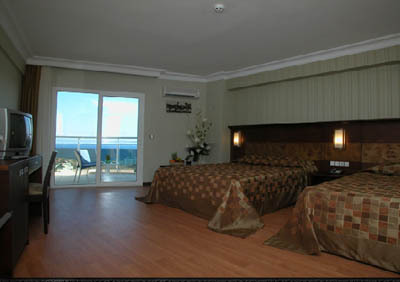 Direct telephone dial * balcony * minibar * safe * internet connection * satellite TV * air condition (split) * bathroom * hairdryer * electronic lock system * fire alarm.